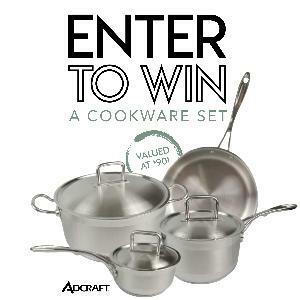 Prize: Enter now to win an Adcraft 7-Piece Stainless Steel Cookware Set! With a beautiful brushed polish finish and an aluminum clad bottom, they have a sleek finish that's a great addition to any busy kitchen. What you must do to enter: You must log in using an email address or social profile. You will receive one or two emails, but will not automatically be subscribed to our newsletter.